The compulsion to see this film again can be attributed to a solid and complete story structure. How many times have you seen it? Is that desire to see it again simply a matter of decades-old nostalgia or could it be the film possesses a quality that differentiates the timeless from the forgotten? Closer examination reveals the latter; The Force Awakens contains a solid storyform at its center. Every complete story consists of four major Throughlines: a Main Character, an Influence Character to challenge the Main, a Relationship Story Throughline between the two, and finally an Overall Story Throughline for all the characters—Main and Influence included—to experience. At first glance, one may see Rey (Daisy Ridley) at the center of the narrative. While she takes on the responsibility for driving the plot forward, this comes as a result of her objective function as Protagonist in the Overall Story, not as the subjective means for an Audience to enter the story. Certainly there are moments personal only to her—the nightmare visions the strongest example—yet these brief moments act merely as the first Act to a Throughline that most likely will span the entire trilogy. 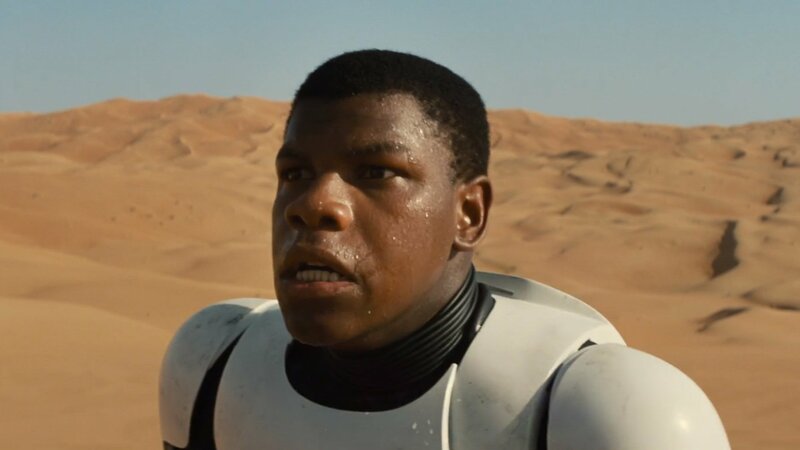 Instead, we look to FN-2817—or Finn (John Boyega)—as our Main Character perspective for this story. Finn’s Throughline begins the moment he lowers his blaster and refuses to fire into the crowd of innocent villagers. “I wasn’t going to kill for them,” he explains later—a justification signaling his Main Character Problem: Support. Everywhere he goes he runs into conflict stemming from this Problem. Cries of “Traitor!” arise from the perception that he—a soldier from birth (Main Character Throughline of Situation)—has switched allegiances. Yet Finn’s problem is not that he won’t fight for the First Order, it is that he refuses to stand for anything—a lack of Support if you will. Other dynamics within the narrative then give Finn a Main Character Symptom of Pursuit and a Main Character Response of Avoid. Main Characters are aware of their Symptoms and think this is where their problem lies. Finn believes his problem is that the First Order will pursue him from one end of the galaxy to the next and thus—as Moz points out later—responds by running away (Avoiding). The only way Finn can truly resolve his personal problems is to Oppose something. He needs to stand against something and refuse to accept the status quo. This complete change of character (Main Character Resolve Changed) comes when he gleefully stands up to his former boss and tells her, “I’m in charge now, Phasma. I’m in charge!” Employing his Main Character Solution resolves his personal Throughline and quite literally opens up the way for the Overall Story to end in success. Like the disdain shown for Finn but on a global level, the First Order’s hatred of the Republic stems from the deep-seeded belief that the Republic supports the Resistance. Only traitors and murderers would stoop that low (Overall Story Problem of Support). Add to that the lack of support from a certain individual who sits on the sidelines of the Galaxy and you have a narrative primed for conflict. Luke Skywalker is missing. Our very first Story Point in the film signifies the inequity of the story and fuels everything that comes after. If Luke simply stepped forward and stood up to the evil forces awakening, none of what followed would have happened. This is how meaningful narrative works: The personal conflict experienced subjectively by the Main Character is repeated objectively in the larger Overall Story. Juxtaposing both points of view grants an audience insight into resolving problems they can’t experience in real life. And that’s why you want to see the film again. Why you want to see any great film again. You are gaining an understanding impossible to appreciate in your day-to-day life. Wrap it up in an entertaining package and you have the recipe for massive success. With the forces of evil growing in power, Finding Luke becomes the Overall Story Goal, forcing the Story Consequence of failing into Changing One’s Nature—in this case, transforming the face of the Galaxy to one ruled by the wicked First Order. Overall Story Issues of Attitude come into play—signified by Po’s cocky demeanor with Kylo Ren (Oscar Isaac and Adam Driver respectively) and Han Solo’s brazen attitude towards his debtors (Harrison Ford). As mentioned previously, Finn’s change of character paves the way for the overall story to end in success: they find Luke (Story Outcome of Success). Without Finn’s Change the Resistance would not have been able to stand up against the First Order (Overall Story Solution of Oppose). Whether or not Finn’s change resolved his personal angst is left to be seen—though it is clear the implication is that his actions were a Good thing (Story Judgment of Good). Rey will eventually be the one to bring balance back to the Force, but for now—in order to bring balance to this storyform—she would have to impact those around her with her fixed attitude, a longing for someone unseen, a hope eagerly anticipated, and a drive for doing the right thing (Influence Character Domain of Fixed Attitude, Influence Character Concern of Innermost Desires, Influence Character Issue of Hope, and an Influence Character Problem of Conscience). Choosing to forgo the bountiful portions in lieu of selling her droid is less a “Save the Cat” moment and more a perfect application of the Influence Character’s Problem of Conscience. Rey easily exhibits all of the above thematics for her Throughline—which explains why she is the perfect foil for Finn and why he seems so astounded when she is able to take care of herself. If you were to write your own story with a character just like Finn, Dramatica would suggest to you a character just like Rey. Whether it was writer’s intuition (a good bet considering Lawrence Kasdan, Michael Arndt, and J.J. Abrams’s body of work) or whether it was the result of working with the application, Rey balances Finn’s point-of-view on every point. Her Steadfastness motivates Finn’s eventual Change. Lastly there is the matter of the Relationship Story between Rey and Finn. Here too the writers chose storytelling elements that perfectly encapsulate the thematics needed to round out and complete the narrative. With a Main Character like Finn, an Influence Character like Rey, and an Overall Story revolving around the First Order, the Republic and Luke’s absence—you would need a relationship between Rey and Finn that started out one way and then morphed into something completely new. Growing from a convenient partnership (“You’re a pilot? !”) to lifelong friends satisfies several key story points within the Relationship Story Throughline. Star Wars: The Force Awakens is more than a cultural phenomenon: it is the continuation of a legacy of great storytelling that began in the 70s,died out in the late 90s, and finally came back in 2015. There is more to the film than familiar faces, recognizable sound effects, and similar situations. The Force Awakens is a complete story, balancing out the four key Throughlines in such a way that the Aidience leaves with a greater understanding of how to successfully resolve certain problems. Anyone wishing to repeat this same kind of success would do well to discover the storyform for their work, and endeavor to fill it with the same sort of life and love.